Wet Shavers have been talking about this soap for years. The history is legendary. Some people like the original others like the new tallow based creation. Since I’ve never had the opportunity to use the first version I can only give you my impressions of the one that’s available now. RazoRock has a standard black plastic tub with a screw on lid for the majority of its soaps. The tubs also have a smaller second lid made of clear plastic, which sits, inside the first protecting the soap and allowing it to be sealed. 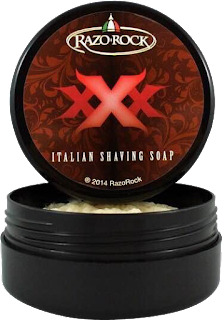 All of Razorock soaps have an opening which is more than ample to lather from. A nice feature of this design is these tubs are stackable but without side labels, this feature is lost. The redesigned label and logo is truly eye catching. The tub pictured is from 2014. What does the term Classic Barbershop scent really mean? Is it Pinaud ClubMan maybe it’s Penhaligon's Douro. Whatever it is Wet Shavers have been discussing this for some time now. One thing that comes up in almost every description is the word “Clean”. It’s a clean scent and that’s what I would use to describe Triple X a clean scent. The strength is on the strong side of the spectrum but after the shave is done it slowly disappears within a few hours. The scent was inspired by Acqua di Parma Colonia Classica. Here are the notes from the website: Top Notes Bergamot, Orange, Lemon, Orange Blossom Heart Notes: Lilac, Lavender, Rose, Basil Base Notes: Hay, Tonka Bean, Patchouli, Musk, Sandalwood, Oakmoss. The Ingredients: Stearic Acid, Water(Eau), Cocos Nucifera (Coconut) Oil, Potassium, Hydroxide, Sodium Hydroxide, Tallow Acid, Hydrogenated Lanolin, Butyrospermum Parkii (Shea)Butter Fragrance(Parfum), Argania Spinosa (Argan)Oil, Aloe Barbadensis Extract(Aloe), Amylcinnamic Aldehyde , Benzyl Alcohol, Citral, Coumarin, Eugenol, Geraniol, Hydrocitronellal, Limonene, Linalool, Isoeugenol, A-Isomethylionone, Oakmoss(Evernia Prunasti). You'll find no issues using a bowl or even if you decide to face lather. It only took me a min to create an incredible amount very rich and creamy. The coverage was great and got right into my 5-day old beard. The slickness and glide were tops allowing me to go over tough spots with my QShave razor without the irritation of any kind. My post shave feel was one for the books. *Please note I haven't used this soap in over some 2 years and it performed just like I just purchased it that day. 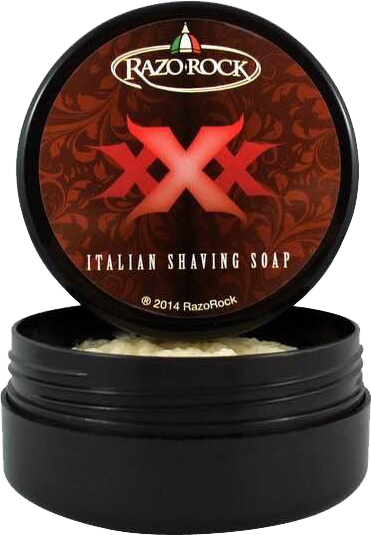 So, another great shaving soap from RazoRock a wonderful addition to any Den. If you decide to give this one a try please don't hesitate on your purchase they run out soon as they become available.